String Day – a free fun day of music making! Come to our String Day! Join young string players from across Lancashire in this inspiring and practical String Day session. 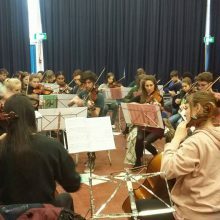 Work with expert tutors and members of the Lancashire County Orchestras to improve your musicianship and ensemble playing skills and finish the day with an informal performance for your parents/carers and friends. Suitable for all ability levels, from beginners to advanced players. “I got to hear some amazing violin players…Miss Harrison is a very good conductor and i’m honored to work with her” Jonny, String day participant. Bring a packed lunch and drinks.